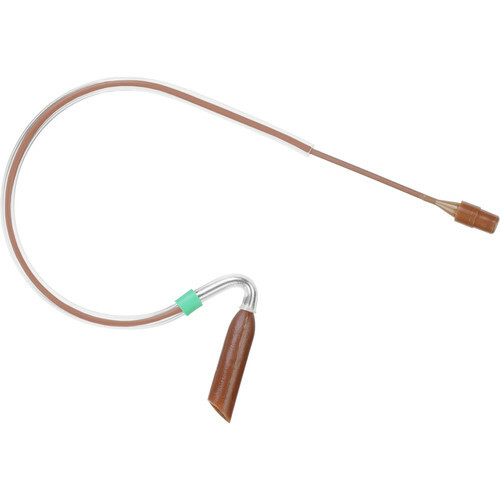 The cocoa E2 Unidirectional Earset Microphone with 1mm Detachable Cable and TA4F Connector from Countryman is an over-the-ear earset, similar to a classic E6 earset, but with a shorter boom designed to work with the Shure wireless microphone system. It provides suitable isolation at the mouth, but with less visibility than an E6 Omni earset, and can be used to capture audio for general speaking and vocal applications. With an equalizing circuit built into the audio connector, the frequency response is tuned so you can experience full-bodied bass and precise highs that are warm and natural. The element, boom, and sub-miniature connector are all easily hidden on the user's face. The boom position near the ear helps to eliminate breath pops and vocal plosives on the mic. The 1mm detachable cable terminates to a TA4F connector for direct connection to a Shure AXT100+, BLX1, FP1, GLXD1, PG1, PGX1, PGXD1, QLXD1, SLX1, UC1, ULX1, ULXD1, UR1, or UR1M bodypack transmitter. The E2 Earset redefines pure sound in a virtually invisible package. It offers better ease of use than a lavalier or podium microphone. There are two aspects of the E2 design that make it possible to capture sound so far away from the mouth: strong off-axis rejection and precisely tuned frequency response. For on-axis interference, the frequency response tuning in the connector of the E2 allows you to fully capitalize on the proximity boosting effect of the mic to achieve even stronger isolation in the voice band. Like the connector for the industry-standard E6, the connector for the E2 is built tougher and more water resistant than previous models. Standard gain, for speaking and vocals. Box Dimensions (LxWxH) 7.5 x 3.7 x 1.2"
E2 Unidirectional Earset Microphone with 1mm Detachable Cable and TA4F Connector (W5 Band, Cocoa) is rated 2.0 out of 5 by 1.